The meeting schedule for the Board of Trustees is the 3rd Wednesday of each month at 6 PM in the Community Room of Clymer Library and is open to the public. You are cordially invited to join us and your input is both encouraged and valued. Minutes of the Board meetings are available at the Circulation Desk in the Library. Finance/Accounting Expertise – Working with the library director, the board’s finance committee is responsible for guiding the fiscal management, capital expenditures, and budget preparation for the library. Marketing/Public Relations Experience – The marketing committee develops and executes all press releases, fundraising campaign communications, and contact with media outlets to promote the many programs and other library activities. 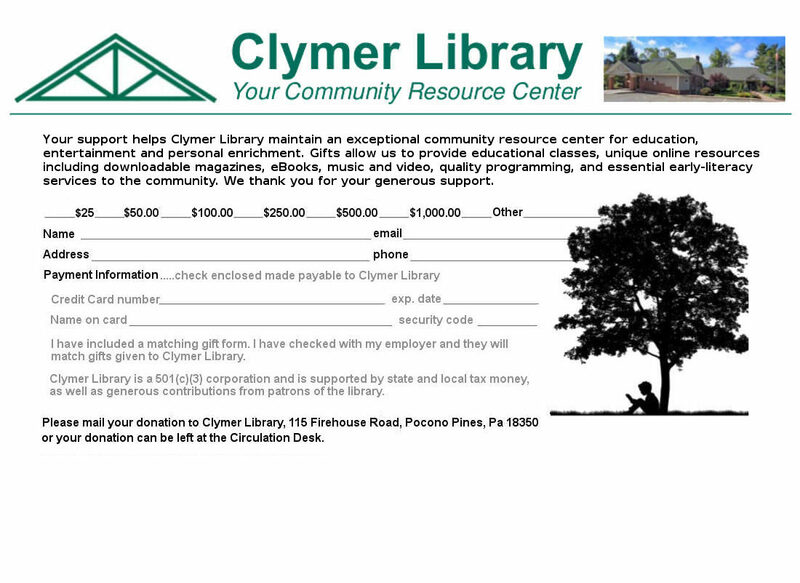 Non-profit Fundraising – As a 501(c)(3) non-profit organization, the Clymer Library relies on community donations, grants, and various fundraising events that require creativity, planning, and coordination with library staff and volunteer management. Facilities Management – The facilities committee assists the library director with day-to-day facilities issues involving contractors and vendors for building and grounds. The committee also assists in the planning of future renovations and refreshing projects. If you or someone you know has relevant experience in any of these areas and is willing to join a working board, please contact the Library at (570) 646-0826 for more information on the application process.